We are here to help you make your dream bathroom a reality. Here at Mr Useful Bathrooms we have the skills and expertise to help you make sound choices about all your bathroom fitments and design. A good installation that has just the right effect, often needs an experienced eye to make it work just right. Mr Useful’s focus is Customer Service. Listening to your needs and giving customer’s assistance to position fitments and decide what is best for the space available. Also all carpets will be covered with a carpet protector rather like cling film to protect you home. Browse our ‘Services’ page to see just how we can help you. Then please take a look at our ‘About Us’ page so that you can get to know more about us. We deal with you personally, face to face ~ with respect for your home, your requirements, and your budget! Our electrical and plumbing work is fully certified to Corgi and NICEIC standards. All our work is fully guaranteed. We want you to be a satisfied customer, with the confidence of knowing you will have the after sale service you need. Whilst working on your job you will get our complete attention - we don't skip about from job to job. You can browse through a selection of portfolio pictures when we visit you or online here! All our professional tradesmen are fully skilled and experienced in their specialist work. 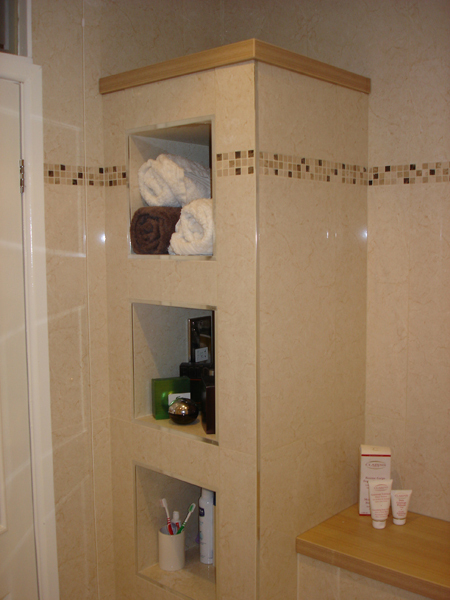 Mosaic tiling and low level shower tray in the en-suite. Bathroom was extended into further bedroom area. Bathroom suite and tiles sourced from Porcelenosa. Clean lines and mosaic tiles. All pipe work is hidden to establish the effect. Bathroom replacement - half tiles and under floor heating in the main bathroom. Bathroom extended into landing area, which allowed for his and hers basins.